It's been a few months since the end of the Naruto manga, and a few months since the premiere of the The Last: Naruto the Movie film. People complained that there wasn't enough background of what happened in-between for other characters. Now, fans get their wish. Monthly, new epilogue novels will be published, each written by a different author with a scenario by the original creator Masashi Kishimoto. The other day, I finished reading the first Naruto epilogue novel, which fills in some areas for different characters between the second-to-last chapter and the final chapter. In this post, I'd like to provide a summary (SPOILERS. BE WARNED), as well as a review of the contents. Naruto - Kakashi Hiden: Hyōten no Ikazuchi (Naruto - Kakashi Hidden Legend: Lightning of the Frozen Sky) was released in Japan earlier this month. The novel revolves around Kakashi right before he becomes the sixth Hokage, but he doesn't want to become one, and thinks that he's not worthy for the position. 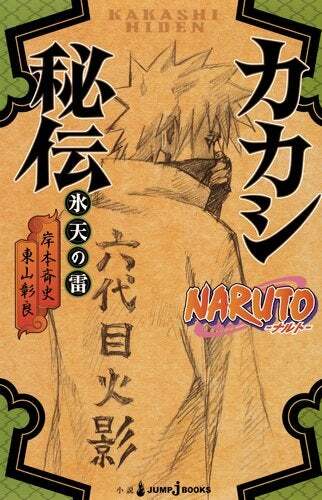 The novel begins with Naruto and Sai chasing Garyou, a leader of a group that admires Madara's ideals and seeks to once again try and reach his goals. Garyou is on the run because in order to do this, he has been doing human experimentation, and has killed many people. Garyou is captured and thrown into Hōzuki Castle, aka the high-security princess. The story changes setting with Naruto meeting up with Inari, the kid from the Land of Waves. He tells Naruto that the Land of the Waves is working on a prototype for an airship, and it's in the final testing stages. While this would be a good thing for the country in terms of short-term sales of ships to other countries, there won't be any need for so many of the workers that have been working on the seas for so long, and lots of people would be out of a job. Upcoming Hokage Kakashi attends the take-off ceremony with Tazuna, who has been working on the ship. Tazuna teases Kakashi about finding a wife, since he's already in his 30's after a beautiful woman in a long dress with wavy hair trips near Kakashi, and he catches her in his arms. Although Kakashi had no intention of riding the ship, he sees a suspicious-looking ninja around the ship. It turns out the suspicious ninja was in fact Rock Lee, who had sneaked his master Gai (who is now wheelchair-bound) onto the ship after Gai threatened Lee that he would cut all ties with him should he not get him aboard. Kakashi chases Gai on board, and Gai denies any interest in the ship, despite his obvious enthusiasm. He also gets airsick. A lot. Right after Kakashi finds Gai, the airborn ship is thrown into crisis when a hostage situation begins in the dining room. The demandee is Rahyou, a disciple of Garyou who says that he wants Garyou released or a hostage is killed every ten minutes. And he's not kidding, hostages are killed throughout the story. He says if Naruto comes, he'll kill EVERYONE in one shot. He also explains that the reason he's so angry at the people of the Country of the Waves is because right after the war, all the doctors of the country were bought out by the powerful countries to help with restoration, leaving none around to help the lower-class people. As such, his nephew who was attacked by bees was not able to get medical attention and died. In between fights, we get an intimate scene of Kakashi and the dress woman hiding together in a bathroom. Finding her safe, he first covers her mouth to stop her from screaming, and reminds her that he's the person she met in front of the airship previously. After she calms down and Kakashi summons Pakkun and the others to find bomb slips hidden across the ship, the woman confronts Kakashi about not handing over Garyou in exchange for the lives of the passengers. She asks him, "Would you not hand him over, even if its costs the lives of all the passengers?" and Kakashi replies, "I'll protect everyone for sure." (Well, this didn't happen, as lots of people end up dying buuuuuut) Ino, Shikamaru, Sai, and Sakura are on the case from the ground (Sai in the sky on his bird), with Naruto left out because his involvement would endanger the passengers. After lots of action scenes, we come to a moment when Kakashi is getting the upper-hand, but then loses all of his chakra without any knowledge as to why. He then sees the dress woman standing above him, and he realizes that this woman is Kahyou, the reported shinobi who has the same bloodline as Haku, and since the beginning, she was the one freezing the passengers to death, not Rahyou, who is in fact her brother, and her son was the one who was killed. However, among her cold attitude, we learn that she still has affection for human life. When a young boy on the ship suffers from a near-fatal athsma attack, his mother pleads to let her die in his place and let him leave to get treatment. Kahyou gives permission to the mother and son to leave, telling a hiding Sai that she will kill the hostages if he tries to get close to the ship again. Sai agrees, and takes the mother and child away. Kakashi remarks in his mind that her dead eyes without tears are in fact more painful than those filled with tears. Finally, through the struggle, Kahyou explains what happened in her past. In the past, she was part of the Land of Waves during the time when massacres among fellow ninja were commonplace (remember, this is the time of Zabuza's childhood). She deserted the village with her husband, and they had a child together. With a few other people who were also missing-nin (lit. runaway shinobi), they tried to create a hidden village of their own so those who deserted the Land of Waves villages would have a place to belong and could receive missions from other villages. However, this was not easy, and unlike Zabuza who showed his anger on the inside, Kahyou's husband held it all on the inside, and he drank heavily in order to drown his sadness. He ended up drinking himself to a watery grave, falling and drowning one night while drunk. After this, Kahyou left the village of the missing-nin and returned to the Land of Waves in order to be able to support her son, who had the same ability as her. One day, while playing with his best friend, the friend was attacked by an entire nest of bees. In order to protect him, her son used his ability to try to kill as many of the bees as possible. However, he was attacked by the bees so much that his face was unrecognizable. Realizing that her son was late to come home, Kahyou went to the best friend's house, only to find him and his mother scowling at Kahyou as a monster, calling the son a monster as well. Despite this, she managed to get them to tell her where they had been playing. She found her son near-death on the ground, and he whispered to his mother, "Hurry and run away... I'll... Get rid of the bees..." Not being able to find a doctor within the village or anywhere nearby, her son perished. After this revelation, Rahyou says he'll let all of the remaining hostages escape by parachute, and Kahyou apologizes for all they've done, saying they didn't want to take lives. However, Kakashi realizes that there are bombs in the parachutes, and that the passengers will explode on the castle on impact, letting Garyou free. Kahyou is furious to find this out, not wanting to take anymore lives. During a fight between Kahyou and Kakashi, he realizes that she is purposely avoiding hitting him. She admits that she does not want to take anymore lives. Infuriated, Rahyou and Kakashi have a fight, with Rahyou almost falling off the ship. Kakashi tells him that in order to change the world for the better, a person must also be righteous, no matter how painful it is. Seeing a future Hokage be so honorable, Rahyou says, "Kakashi Hatake... So there were people like you..." as he falls to his death. Kahyou, devastated, screams and sobs and reaches after him, and Kakashi embraces her in his arms, letting her cry in his chest. In the middle of romantic moment, Kakashi says that unfortunately, he has to interrupt their moment, because the ship is rising so high that the pressure will kill them. Through a long sequence, Kakashi and Kahyou work together to save the ship. However, when they land, Tsunade orders soldiers to throw her in prison. Kakashi, however, takes it upon himself to be responsible as a future Hokage, and orders that Kahyou's punishment be that she is isolated as the warden of the prison. He meets eyes with her and tells her that since she wanted the power to change the world for the better, the job she is given is a perfect place. She thanks him. In the epilogue, Kakashi tries constantly to read a single letter from Kahyou, but is interrupted by various ninja, saying that he's reading a letter from a lover. Apparently, Naruto had seen Kakashi writing a letter to Kahyou, but had crumpled up the letter time after time, trying to get the perfect words on paper. While remembering that spring is coming while reading Kahyou's letter, he remembers Obito, kind of a "life is precious" moment. Something that I feel is a bit disappointing about this novel is the lack of illustrations. The cover is the only illustration by Kishimoto. I would have loved to see a character design for the heroine (or semi-heroine) of this novel, as it was hard to imagine a "wavy-haired" ninja without thinking of Kurenai or Hotaru. I tried to think of an older-Rin-looking woman. It also feels as if the plot line about Kakashi finding his resolve to become Hokage is a bit rushed. 97 percent of the novel is about the hostage crisis, and I feel that the "Now he is ready to become Hokage" was a bit shooed-in. However, although it didn't have much time, Kakashi using his powers of Hokage to save Kahyou was a good way to show his resolve, even just a little bit. What are my thoughts for the future after reading this novel? B) I am seriously starting preparations for an unofficial translation of this novel. C) I'm so excited for future novels.